You always keep track of your latest visitors with the help of different Geo tracking tools like Google Analytics. However, have you ever though about displaying recent visitors details in the sidebar of your website? You might find it unprofessional thing to do, but it is an ideal way to tell your new visitors that they are not alone who're visiting your website. Through this technique you can convert your new visitors into followers as some of might like your Facebook Page or become email subscribers. Today in this article, we will show you how to display live recent visitor information in blogger. 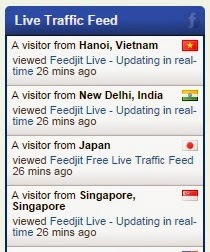 Feedjit is a live visitor traffic widget that is trusted and used by million publisher across their blogs and websites. It displays the traffic of website in real-time. Feedjit plays significant role in engaging and creating an amazing user-experience. This widget displays the location as well as the last page user visited before leaving the website. 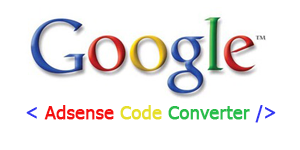 The whole information that it provides is in real-time just like Google Analytics. If you are still not satisfied go to Feedjit.com and see the demo of the widget yourself. The first thing you need to do is to go to feedjit.com. 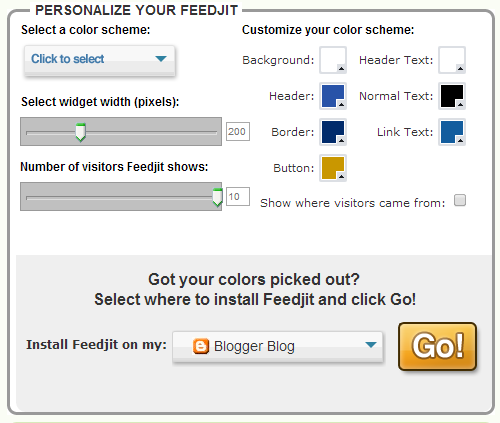 Once the page finished loading, you will notice a tool called "PERSONALIZE YOUR FEEDJIT" (as it can be seen in the screenshot below). From here you can customize the widget completely by changing the color, the number of visitors to show and etc.. to completely match your website's desire needs. 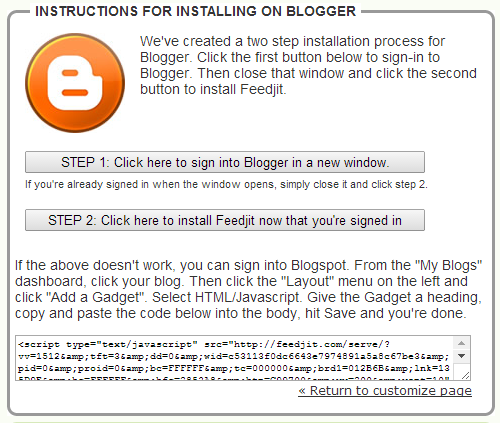 Once you're done customizing the widget, select the "Blogger" from the drop down menu and simply press the "Go!" button which will take you to a new page consisting of the widget code as it can be seen below. Don't forget to share this awesome tip to your friends!